Swiss Needle Cast Disease 101 | Mr. Tree, Inc. When you think of the Pacific Northwest, you can’t help but think of timber. The stately forests cover vast acres of land, providing everything from food to shelter to a natural beauty we all can enjoy. These forests contain a variety of trees, but for many of us, when we think forest, we think evergreen. And here in Oregon and Washington, that means Douglas Fir. Douglas fir contains six different species of coniferous evergreen trees native to western North America. A Douglas fir has long, flat, spirally arranged needles that grow from each branch. You’ll find yellow or blue-green needles have a short stalk near the base with a grooved upper surface. Not only do they define the forest here in the Pacific Northwest, but they also grace our landscapes on our properties. Imagine driving around Portland or Vancouver, for instance, and not seeing the mighty Douglas fir throughout. If you have lived on properties both with mature trees and without, you understand the value a tree can provide. They contribute more than shade; they define the look and feel of a home. They add value when it comes to selling. They add curb appeal from the moment you drive up. Which is why as a homeowner, you probably take great pride in keeping your trees in top shape. It’s not a lot of work. In most cases, trees do pretty well on their own. As long as they get the nutrients and water supply they need, they’ll thrive for years. In the late 1990s, Douglas firs began to appear with thinning foliage and yellow needles. Scientists recognized there was a problem and began to investigate. Unlike many problem diseases that plague vegetation we use in our landscapes, needle cast disease is native, not an invader. It evolved right here in the Pacific Northwest. Scientists have determined that the problem grew due to a variety of variables, but one of the key factors is winter temperatures that have risen steadily since the 1960s, on average a half a degree each decade. Known as Swiss needle cast disease, it is a fungus native here in the western United States, but it is also an exotic pathogen in Europe, New Zealand, and other locations throughout the world. It was first discovered in plantations in Switzerland in the mid-1920s, was given the name Swiss needle cast disease (SNC) and the name has stuck ever since. The disease is caused by a fungus known as Phaeocryptopus gaeumannii. As it forms and grows, the fruiting part of the fungus develops in openings in the needles. This clogs the needle and restricts its intake of CO2 and blocks the photosynthesis process. As this process continues to grow and fester on the tree, the needles become more blocked. When it reaches 25 to 50 percent blockage, the needle no longer performs its job efficiently, and the tree begins shedding the weak links. Older infected needles turn yellow and die. Eventually, the tree struggles to produce the correct amount of nutrients, and its growth shuts down. If you were to look at the rings of a tree impacted with Swiss needle cast disease, you would find the stressed tree no longer forms rings of growth. Growth is so slow, in fact, that the rings of wood never make it around the entire circumference of the tree. Looking at the layers, you would find normal growth rings for years; some bigger, some smaller, depending on the rain and nutrients provided during that year. But when you looked at the last years of its life, the years it was impacted by needle case disease, you would find the rings all jumbled together, as if they didn’t exist at all. What’s more is this problem is growing more rapidly as climate change impacts everything we do. Early climate modeling shows that this disease is going to continue to spread widely over the next 80 years, moving in all directions throughout Oregon and Washington. It could allow other native trees to quickly regain their competitive advantages and edge out the once mighty Douglas fir. If your landscaping already contains Douglas fir, you don’t have to eliminate it from your property. Instead, recognize the problem early and ensure the health of your trees by staying active in the process. Start by controlling the vegetation around the base of the tree to increase air circulation and reduce moisture accumulation. By leaving plants, needles, and other vegetation in place, it provides a rich blanket of material ripe for holding in moisture. And that’s a sure way of letting the fungi set in. 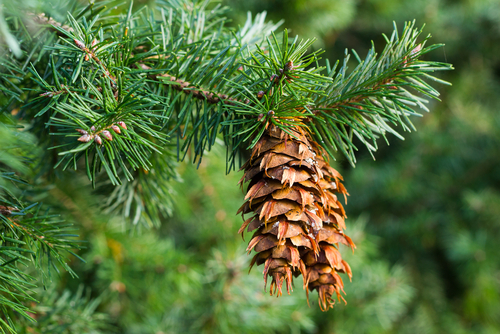 If you are considering planting a new tree on your property, don’t shy away from Douglas fir. Instead, get to know your source. Are they reliable for providing high-quality landscaping? Can you be sure you’ll receive healthy plant stock? Part of keeping a plant healthy is to start with healthy stock right from the start. Then, stay on top of the health of your tree. The earlier you identify problems, they easier they are to cure. Which means you can minimize your losses simply by early detection. Scientists are developing Douglas firs that are more hearty and needle cast disease resistant, which will be favored especially in new trees being planted. There are also chemical sprays available that can be used to stop the growth of needle cast disease before it has a chance to impact the tree fully. It needs to be sprayed at specific times of the year, however, so working with a tree service company early can mean the difference between having a healthy tree on your property or losing the tree altogether. Are your trees as healthy as they could be?